The 2014 edition of The Best of Britain’s Political Cartoons is, once again, a comprehensive and hilarious look at the last 12 months of British life – including local misfortunes with our party leaders, UKIP, and the floods, and foreign travails in the Ukraine, Syria, Iraq, and Gaza. The Best of Britain’s Political Cartoons 2014 is a tribute to the art, power, and intelligence of our finest cartoonists working today, such as Peter Brookes, Steve Bell, Chris Riddell, Dave Brown, and Christian Adams. 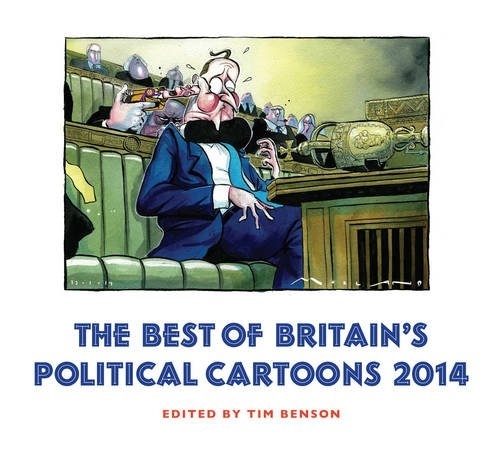 Curated by Tim Benson, the UK’s leading political-cartoon expert, it’s the perfect collection for the curious mind. Tim Benson is the world’s leading authority on political cartoons. He runs The Political Cartoon Gallery, the world’s largest website for the sale of original cartoon art, and regularly curates exhibitions at his Cartoon Cafe in Eastbourne, UK. He has produced numerous books on political cartoonists, including Churchill in Caricature, Low and the Dictators, The Cartoon Century: modern Britain through the eyes of its cartoonists, and Drawing the Curtain: the Cold War in cartoons. He is presently working on Over The Top: a cartoon history of Australia at war to commemorate the 100th anniversary of the Gallipoli landings in April 2015. Great art – good laugh. Great political cartoons – all the best ones from the past year. Such a laugh – Miliband as Gromit etc.